Chocolate and aqua a lovely combination. 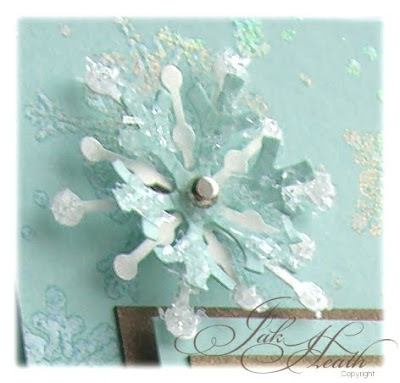 The aqua base card was stamped using the Rollergraph snowflake stamp inked with versamark then heat set after applying bridal embossing powder by Ranger, I'm not sure you can see all of the subtle twinkles that this powder gives but it is simple gorgeous in the flesh. I used the same powder to heat emboss the Lovely as a Tree stamp by Stampin Up only this time using it on the chocolate coloured card then dividing it into 4 pieces and matting and layering it. Lastly I punched 4 holes into the topper aqua card and threaded and tied a chocolate ribbon through the card. finished with a little Christmas tree charm and a pretty snowflake. The snowflake was made using 2 snowflake punches then a little drop of clear drying glue on each and dipped into Crushed glass glitter to give the sparkle, a brad was added through the centre. Absolutely stunning Jak! The colours are gorgeous! Many thanks for the poinsettia print outs too. Fabulous color combo and a gorgeous result with the crushed glass glitter! May have to find some of that myself before the holidays! Yet another stunning card from your talented hands Jak, i just adore this card and yes i can see twinkles when i zoom in on your pictures. Love the idea of dividing the image in 4. Oh Jak, I just love this colour scheme and you have made such an elegant card. Thank you, too, for the lovely poinsettia sheet. It's lovely Jak as always, love that stamp set it's beautiful. Thank you very much for the lovely Poinsettia sheet, it's very kind of you. I came across the box containing my rollergraph rollers, and they are out to use on a card in next couple of days. ps and another Thankyou for the poinsettia images from me too. Hi Jak - this is a lovely combination and so elegant. Love it! Love those frosty trees! Card is beautiful!! Gorgeous card Jak, just love the colours. Two of my favourites Jak - trees and chocolate and blue. Love it. What an absolutely stunning card Jak! Gorgeous card Jak! I love this stamp set, I never tire of it. Thanks for the great idea using it. Gorgeous!!! Love the colors and the sparkle! This is fast becoming my favourite colour combo. Love your card - so elegant but still very pretty. I love the colour scheme...one of my favourites! What a lovely card too. Im a bag lady!! Glitter transfer paper, must have a go with that! Oh my, what a beautiful card. I clicked on your blog from Sharon's blogroll (she and my mom bead together in GA--I'm in Canada). The colours are lovely, and so is the design.